and its absence can never be compensated for." 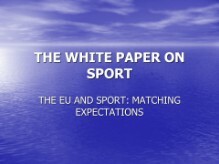 The White Paper on Sport contains a number of proposed actions to be implemented or supported by the Commission. These actions are brought together in the present Action Plan, named after Pierre de Coubertin. The Action Plan will guide the Commission in its sport related activities during the coming years while fully taking into account and respecting the principle of subsidiarity and the autonomy of sport organisations.